This past weekend the family got the chance to visit with some friends a little south of here at Badin Lake. We had a great time down there given the hospitality of our hosts. They were very nice to us. Last year we got to visit Smith Mountain Lake for a weekend. We are not sure how this might turn out, but if we are lucky maybe visits to friends on lakes can be a little bit of an annual summer event for us. We can wish, can’t we? This trip was very eventful for Mara. She had the opportunity to experience a lot of firsts for herself. We got to the lake on Saturday, and almost immediately got into the water. After some playing around the dock, we took a break for lunch. Then it was off on the boat to see the lake and make a pit stop in a quiet cove for some more swimming. 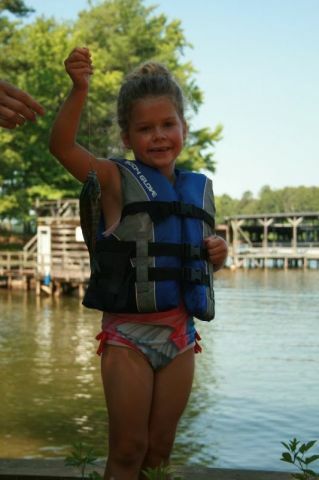 There, Mara had her first chance to jump off the top of the pontoon boat and into the water. It had to be about 8 feet from the water. She did it with no fear. When we got back to the dock it was still a little early, so we took some time to play again. 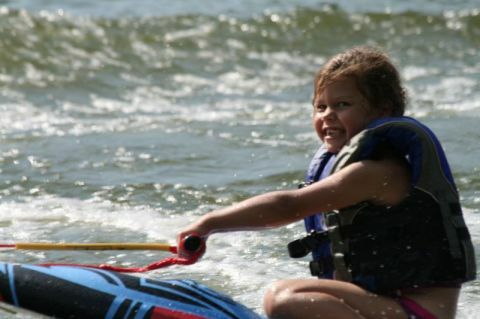 Someone broke out the knee board, and it was time for Mara to show her stuff again. First time trying to get on the board she did it! No problems. It was pretty impressive. Now, the one thing was that she didn’t exactly sit up and lean back on the first run. But after a break and getting a chance to talk to her, she got it right on the second try. Look at me! This isn’t hard. We really exhausted the kids on the first day. We thought it could be some trouble having them stay together in the same bed so we put Campbell in bed first to fall asleep, and then Mara. I don’t think in the end it was any trouble at all. The next day we got a little bit of a slow start. But, that is what a relaxing weekend is all about. After breakfast the kids started doing some artwork. Then it was down to the lake again. The first event was some fishing, and again, Mara’s first time for that (sorry Grandpa). 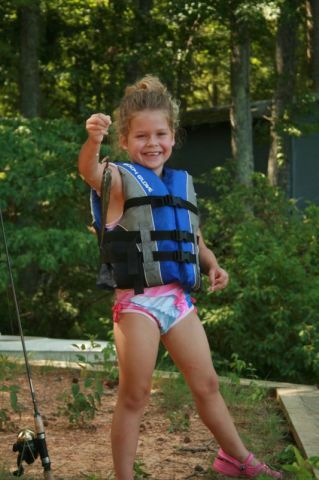 Mr. Kevin told us the special spot to cast from, and as soon as Mara put it in the water she caught her first fish! She ended up catching two on the day. 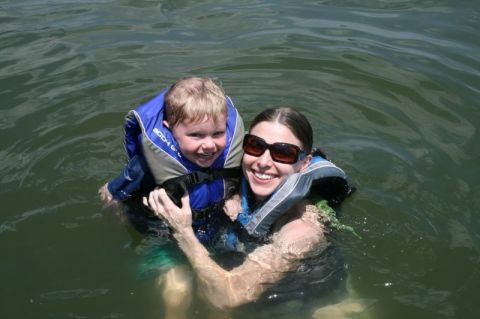 The rest of the day before leaving in the afternoon was more knee-boarding, swimming, and jumping off the pontoon. What fun! There are lots of pictures in the gallery, so click on any of the pictures and then click on the album link or just go here. The kids are pretty lucky. Yesterday, Lisa decided to take them out for a little bit of bowling. I actually don’t think I have ever been bowling with the kiddos myself? Mara and Campbell love it. They are using the ball ramps or guides (what are they called?) so there isn’t any independent play yet, but they are still doing pretty well. Better yet, Lisa invited some of their friends to come along if they weren’t busy. And sure enough some were able to show up. 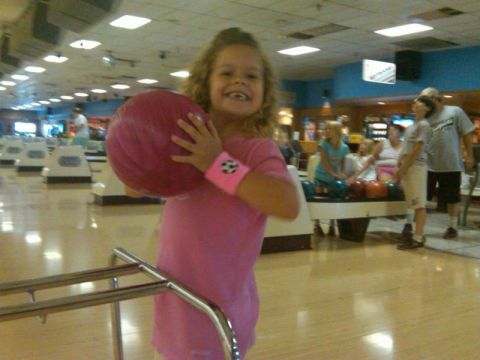 Nothing like a little bowl play date in the middle of the week. Surprise, surprise. Mara chose a pink ball. Campbell seems to be serious. 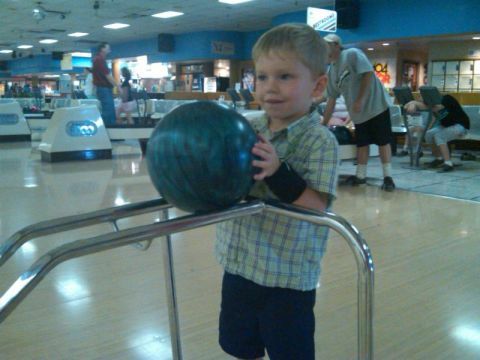 Oh, and yes, the wristbands do help bowling scores. FYI. 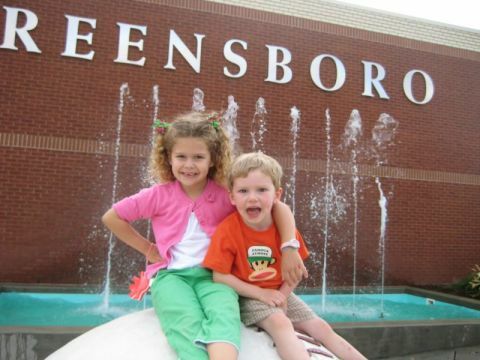 This past Wednesday we got the chance to go to a Greensboro Grasshoppers baseball game. It was courtesy of RF Micro Devices as they did a company outing for a free game. We got there early in order to use the opportunity to get some dinner. The kids just love hot dogs at the ballpark. It was a good time. The Hoppers didn’t do so well in the first couple of innings and we didn’t stick around for the full game to see the outcome. 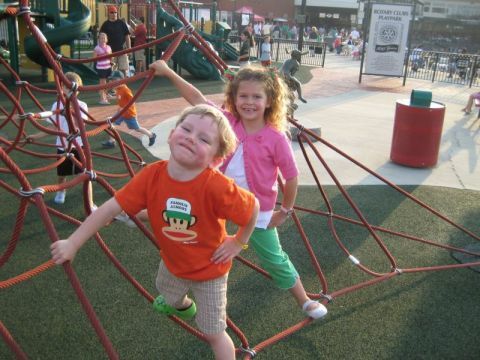 Most of the time the kids just wanted to hang out on the playground and play. They didn’t watch the game very much. This was really the first time that Campbell was old enough when we went to a game to get around on the equipment. Mara was all over everything and much more familiar with it. It was nice to just let them roam around on their own without a lot of help. Even though we didn’t stay the whole game, it turned out to be a late night. 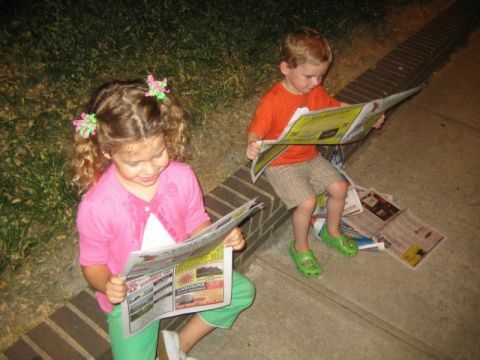 The kids were tired and had to have a seat to rest and read the paper. Click through one of the photos to see a few more shots. On Saturday the family went out to get in the middle of an Easter egg hunt. One of the local radio stations puts on an event at the farmer’s market and we went to check it out. It was bigger than we expected. 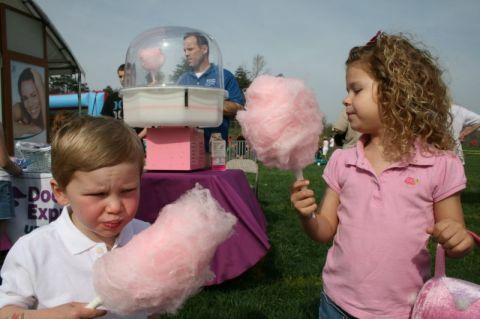 They had some booths for promotions, some vendors of the typical carnival type atmosphere, and other activities for the kids to do. We got there a little early, and we are glad that we did. It got pretty crowded. 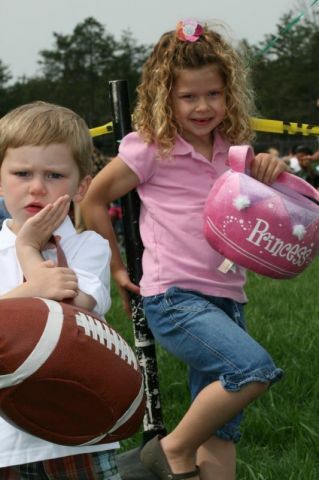 When we watched the crew put out the Easter eggs on the vast grassy area, I thought it would be plenty and the kids would have a ton of fun picking them up. Campbell’s turn was first, and all that he came away with was three eggs! The mob was like a piece of farm equipment, sweeping up everything in it’s path and leaving nothing behind. For his age group they let the parents go out as well and it was good that they did since it was chaos. But, I think some parents were picking up the eggs to help, but that didn’t help the kids that tried to do it on their own. Better luck for Mara then, since there were no parents. Well, it didn’t turn out that way, as Mara also came back with only three eggs too. By the looks of it she was off to a better start than Campbell, but it turns out it was misleading. She also had trouble, as some parents still went out there. Also, they let kids from the younger age go out if they missed their regular start time, so that just meant more kids. It was busy. After the egg rounds it was time to go and get some lunch. It was a hunger generating activity! 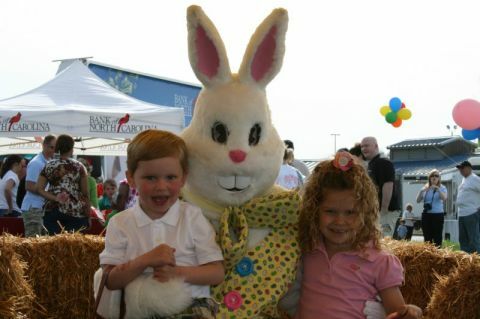 What would the holiday be without the bunny? Easter nutrition at its best. Zebras, Zebras, and Zebras, Oh My! This past Saturday we celebrated Mara’s 5th birthday. 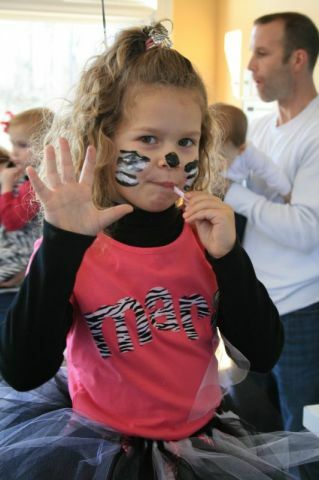 The theme was zebras, and Mom organized a wonderful party for the little miss. We had a few activities to keep the kids occupied. For the most part they went off with no issues, which was great. 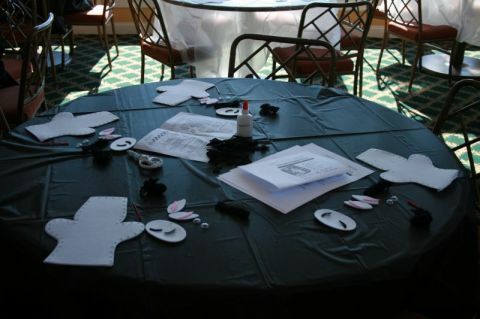 First we started with a zebra puppet craft. It was a little difficult for the kids to accomplish, or at least the first sewing step. There were a lot of parents doing the sewing. But the second step of putting on the faces and fur was right up their alley with a bit of gluing and placing. Just waiting for the kids. Next, the face painting was also a big hit. 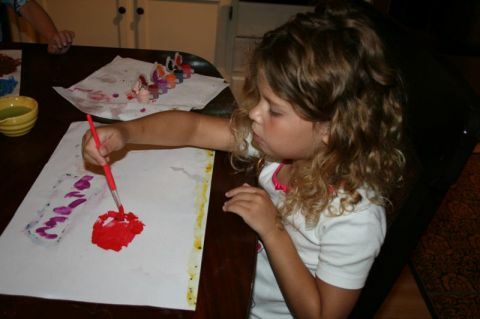 We have Lisa to thank for that idea, and also the execution as we had no idea what to do for the painting. She nailed it because the kids absolutely loved it. 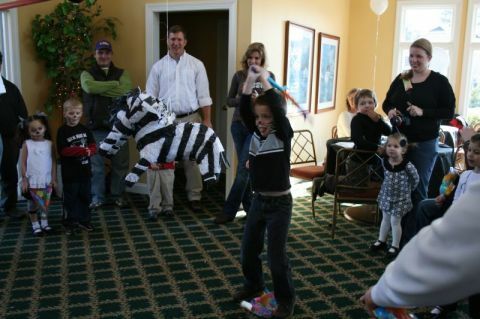 Lastly, the pinata was probably the most tenuous part of the party. Having young kids swing a big stick wasn’t the greatest of ideas, but it went off without a problem. We didn’t anticipate the scrum for the candy either and that got a little hectic. But, everyone survived and made it to the end. This is the end of the road for you zebra pinata! It was great to have all the friends come out to celebrate with us. We know that Mara loved seeing everyone, so thank you. 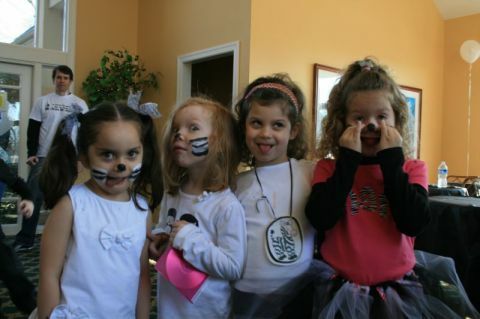 Friends make parties the best! To see the rest of the pictures, visit the Birthday10 gallery. About a month ago, Mara complained that she had hit her mouth on something. 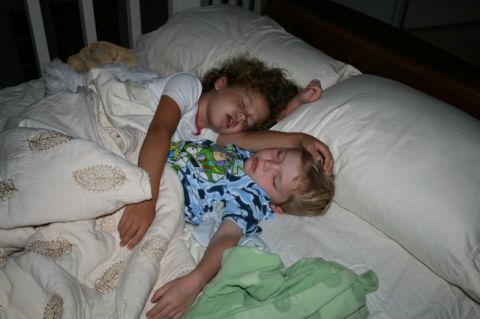 Like most occurrences like this that are not seen by the eyes of Mom or Dad, getting details was a little sketchy. What was clear, however, was that Mara said one of her bottom teeth hurt and now it was loose. So, did she knock her mouth on something hard enough to loosen her tooth? Mara seems to be growing up faster than we think. It seems early, but a week or two later we could see that behind the loose tooth there was white in her gums and another tooth was coming up. Her tooth was certainly loose because she was loosing it for her permanent tooth. Since that time the other tooth in the center right next to it is loose too. These teeth were her first to come in, so now they are the first to go. We have been working on the tooth for quite some time. Mara has been pushing it around trying to loosen it up, but gets scared and says it hurts. Well, tonight was the night. Mom asked to see how loose it had become and Mara went to push it over to show her, and “pop!” Out it came. Now the tooth fairy is coming for a visit. Just this past Saturday Mom came up with the idea that we should take the kids ice skating. They were really excited and had been anticipating it for a couple of days. When we got to the rink that day we were surprised to see that the parking lot was full and the place was really crowded. Luckily inside and on the rink was not as bad as it possibly could have been given the numbers of cars outside. 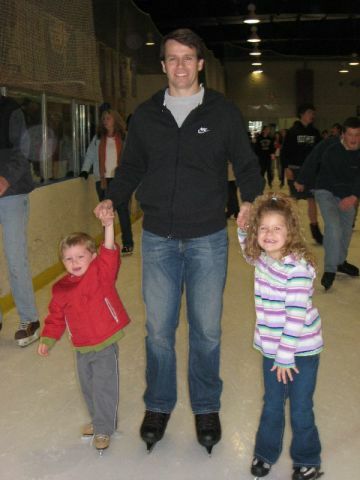 We were also lucky that they had the right sizes for all of us to wear skates. The sign on the window coming in said they were out of many of the common sizes. We made it work. Mara was REALLY enjoying herself on the ice. Even at times where she was beginning to fall she found it fun. 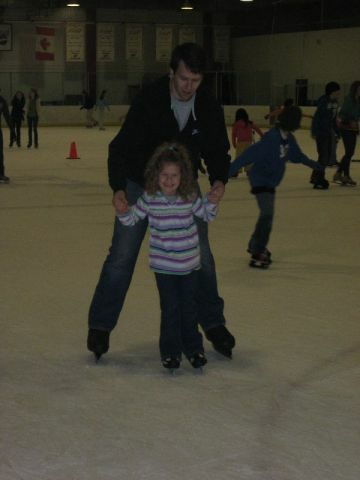 Of course, she was being held up the whole time so she wasn’t really falling all the way to the ice. So swinging around wildly around daddy was a good time. Having lots of fun on the ice. Campbell on the other hand wasn’t having quite as good a time. 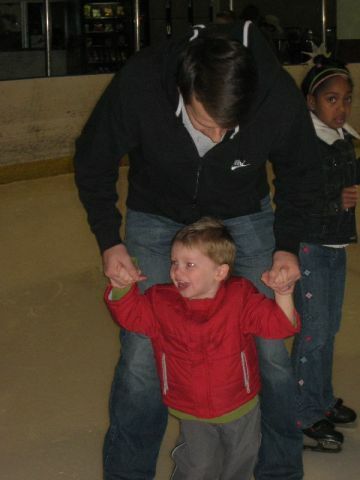 It was great that he had no hesitation to getting out on the ice and no fear at all. It was just that the whole thing wore off for him a little sooner than his sister. He got tired a little faster too. However, we were impressed with how much he did. We think this is going to be an activity we will go back to do again. Umm, hope he doesn’t fall down.